Whether your addressing question from prospective students at a college fair or selling tickets at a high school basketball game, you want to look professional and display enough color to be noticed through the crowds of students stampeding by. It's also not a bad place to store all the items you don't necessarily want seen in a crowded walkway or auditorium. The types of events that colleges and K-12 schools typically attend are continuous events. Events related to Sports, Alumni, registration, book fairs, graduations and the list goes on require staff and voluteers to direct and inform students, visitors and alumni. Having a professional appearance helps to maintain order in what seems like chaos and adds to the pride of the attendees. Additionally, it is another great opportunity to brand your school, team, fund-raising group, or club. Not only does it continue to imprint the name and logo of your group in the attendees' minds but it adds credibility to your organization when you present yourself as professional. 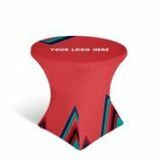 Whether you choose to use a stock color table cover or to have your school or group's name or logo printed on it, we offer commercial-grade table skirting and we mean only commercial grade quality. If we offer it, it is made of high quality polyester fabrics. It either adheres or exceeds the stringent fire-retardant standards required in large convention centers across the country. Most of our table covers and skirting are heavy, machine-washable, and wrinkle resistant. We specialize in Commercial Fabric products. These table covers, throws, and skirts will serve you for many years. No Setups. 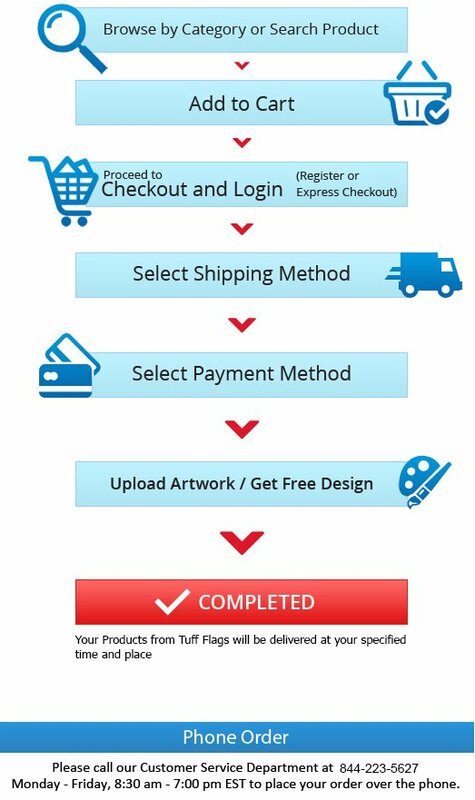 No Artwork Charges. 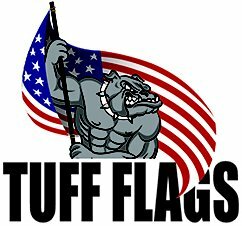 If You Like Our Commercial-Grade Flags, You'll Love Our Table Covers and Throws. Our table skirts are produced at the same commercial quality as our flags and other fabric products. Machine Washable and Wrinkle-Resistant. All of our stock table skirting and cover items are fully customizeable if you choose. 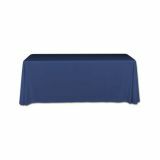 Most of our table cover products are flame retardant which will be indicated with a Flame Logo. Choose from dozens of colors and styles. Covers are available in the popular materials: Heavy Polyester, Twill, and Satin. Styles include the trendy Stretch, Box Pleat (Accordian), Shirred Pleat, and Fitted styles as well as the traditional Throw Cover. 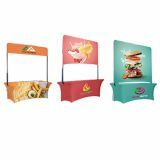 You will see offered in our Table Cover products referred to as All-Sided, Open-Back, and Zipper-Back. That simply means the Throw covers 4 sides if it's a All-Sided cover and 3 sides if it's the Open-Back. It's a personal preference, many people prefer the open back over the all sided because they like the back side of the table uncovered for easier access and seating. If you would like to discuss your event or purpose with us as to which table cover product is best for your purpose and budget, please call us at (888) 287-3524, talk with us on Live Chat, or email us if you like at customercare@tuffflags.com. You'll receive a prompt response.